Becky was raised in Austin, Texas. She followed in her parents' footsteps and graduated from Baylor University with a BBA in 1977. While at Baylor, she married Jim Lozier, Jr. and in their 36 years together, they've raised three children - Liz, Kate and Ben - as Jim developed a career in Commercial Real Estate and they both served their churches and communities. Becky is a lifelong member of church music programs and has served as choir officer, ensemble member, soloist, children's choir teacher and more at Hyde Park Baptist of Austin, TX, Tallowood Baptist of Houston, TX, Columbia Baptist of Falls Church, VA, and Park Cities Baptist of Dallas, TX. As a leader in civic organizations in Dallas, where Becky and Jim have lived since 1996, she has served as the chair of fundraising events, acted as a board member and taken on the role of President for Junior Charity League of Dallas and Dallas CASA (Court Appointed Special Advocates). 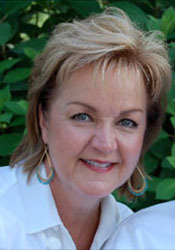 Becky has been a member of the advisory board of the Center for Christian Music Studies since 2007.